Do you work for money? No matter what you say, everyone work for money. Money is the basic force which compels even the laziest man on earth to work, because work gives us money and money makes us buy anything or many things. So it is always good to see when people makes good money. You already know that more money makes you more famous means the more money you have the more attention you grab. I have shared the various ways till now in my various guides about how you can make money online or make money blogging. Today I am going to share about The Secret Formula For Money Making Online Blogging : InfoGraphic. Infographics are the great way to say things effectively. 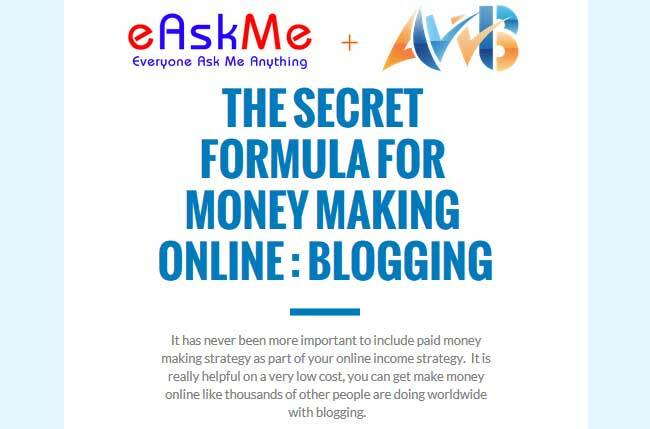 Now lets see what is the secret formula for money making online with Blogging. Do share how can we help you? If you have any suggestion, feel free to ask via comments. Don`t forget to like us on facebook and subscribe eAskme newsletter to stay tuned with us.